I spotted these Plug and Play IP Cameras (IP900) at K-Mart for $30 a pop, so decided to grab a few to see what they are like. On first appearances, they look like FOSCAM FI8918W clones. Setup is very easy, just need to plug the power suppply into the camera and hook up the network cable from the camera to your router. Once the camera has finished booting up, you can run the Search tool from the application CD to start setting up the camera. When you start the Search Tool, it will scan your network for your cameras, and display them in the Cameras box. As you can see, I currently have 3 cameras on my network. Clicking on one of them in the Cameras box will bring up the details in the Information box on the right. Clicking on Open on the bottom right will open up the web inteface for the Web Cam. The default username is admin with no password. After logging in, you will be presented with this page. 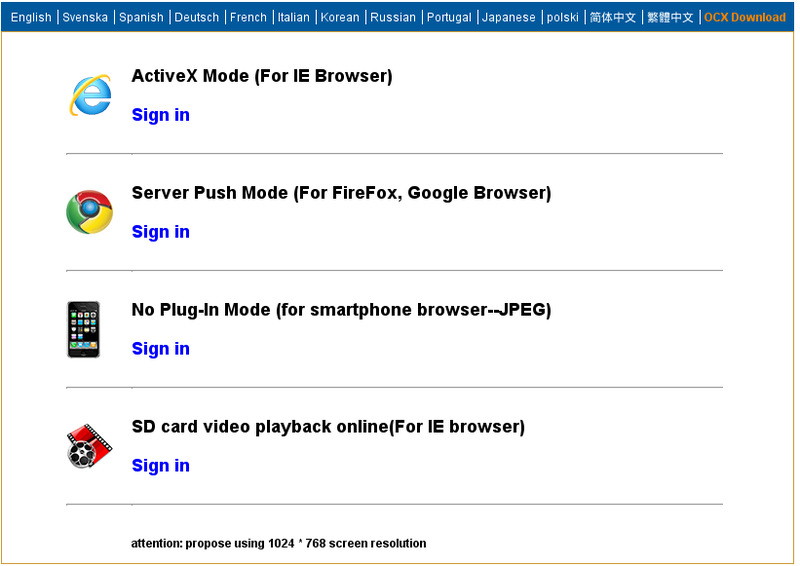 If you want to use the IE controls, you’ll need to install the oPlayer file from the Application CD. Compared to the “Server Push Mode” controls, The IE controls gives you a few more options to control the camera like Frame Rate (from 1-30 fps), Enabling/Disabling the OSD, and being able to take videos, pictures, control the IR LED and flashing green Signal Lamp on the front, and listen to what the camera is hearing. You can switch the resolution between 640×480 and 320×240 on this screen too. Clicking on the “Tools” button on the bottom brings up the control panel on the web interface where you can set up the date and time, change the admin username and password (which you should do right away! 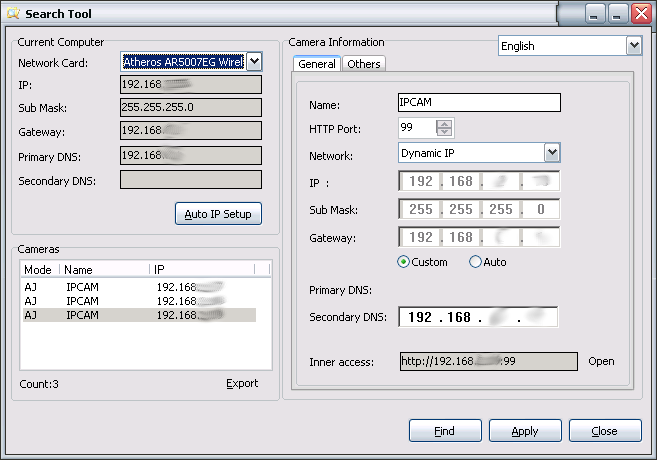 ), set up the WiFi capability and network settings of the Cam, as well as the email alerting, and motion detection settings. All of these settings can also be managed from the PC IE View application on the Application CD. Remote access is provided through a “cloud” provider – hence the need to change the username and password. Once you’ve downloaded the Android app p2pipc, you can use it to search for cameras by tapping the “Tap here to add camera”, and then tapping “Search”. As long as you’re on the same network as the camera, the app will display the cameras that are on the network and allow you to add them to the app. Once the cameras are added to the app, you will be able to access the cameras as long as the camera can connect to the internet. The quality of the snapshots are fairly clear in both day light and low light. You could easily make a face out from ~7 meters, which should be fine for an indoor camera. These cameras are great value for $30, allowing for eyes and ears while you’re away from the home. The resolution is only 640×480 but there’s still enough detail to make out faces in the event of something happening. You can take photos on the mobile app if need be, and can also do motion recording and set the camera up to email you if there’s any motion occurring in view of the camera. Recording to SD card is also supported, however I have not had the chance to try that out yet. If there’s enough interest in this post, perhaps I will blog my results with this camera. 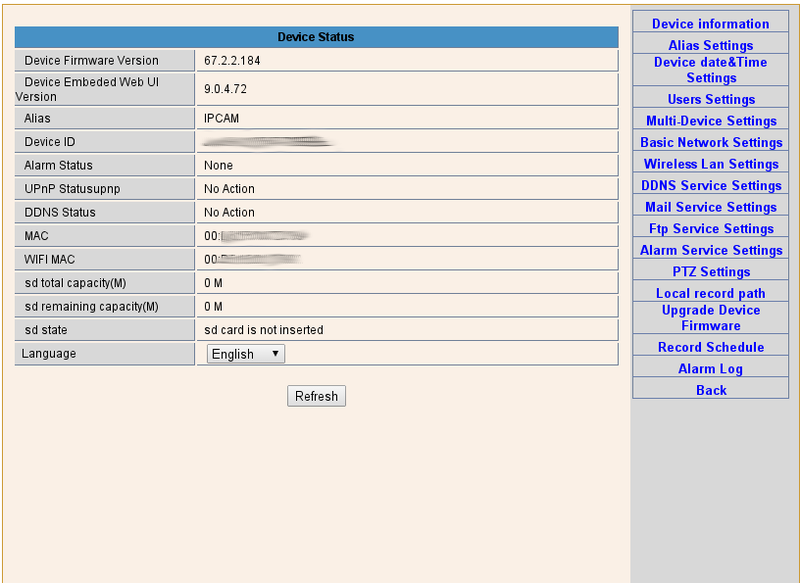 Hi, I also have my IP900 up and running in Ispy and in Netcamstudio. Recently after a factory reset the IR lights do not come on in the dark. Nor will they come on manually. When the power is turned off, brief wait, and then on again, the LEDS light up but go off again straight away. Any ideas on how to get them going again? 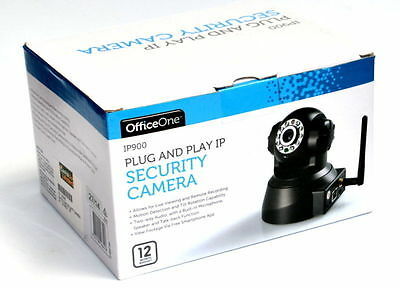 I would either use the Windows Software or use the Windows ActiveX client to check the IP Cam settings. If you use the ActiveX Controls, there is an “IR” button in the the bottom right, make sure that is lit up green. Thanks for the response. Unfortunately they do not respond in neither situation you have described (neither in ActiveX nor using the software). Thanks anyway. My other one that I had boxed up, I have setup today and it works fine. Must’ve had something to do with the reset I think. Keep in mind that it needs to be dark for them to activate. 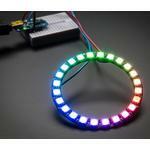 Also if you have an Android Mobile, you can also use the Android App to turn the IR LEDs on and off. Hello. i hv recently bought this second hand. But CD was not their. Anyone has the CD could copy it to me. Without that i can not connect it to my wiress network. I recently pick one of these up without the Disk. I came across this helpful post. I’ve tried to access the link above but none of it will allow me to select anything. I can see files in there but it won’t let me choose one. Can you help at all. You shouldn’t need the disk anyway to use the camera unless you want to use the software. Otherwise there should be a download button on the page somewhere…top right maybe? 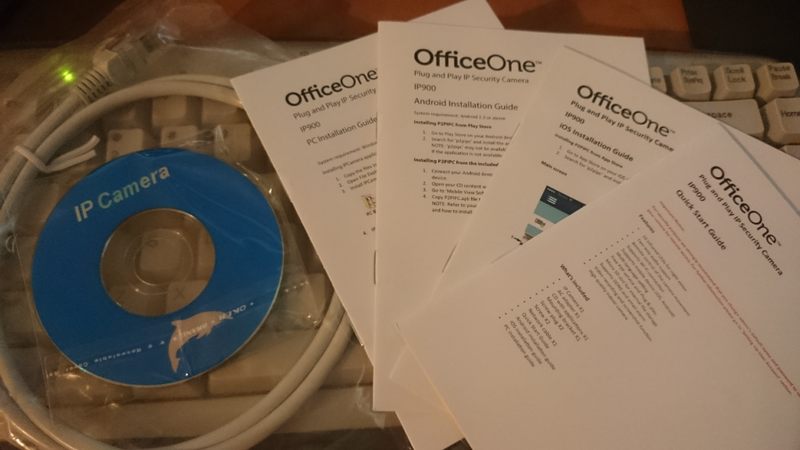 I have OfficeOne SC4DVR and im having trouble setting it up, im getting a signal from all 4 cameras but no display, and the big problem is the menu’s username and password. i tried alot of default passwords that i can think of and none of them works. pls help. We have set up the same (2 Cameras). 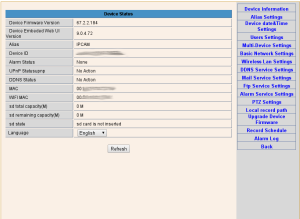 No settings are changed, the IP is assigned via DHCP. It can be accessed via mobile for a couple of days and then it shows offline. If there is a power failure the camera rotates automatically and the view changes. Will i have to set local IP’s instead of DHCP? Can you still access the cameras from inside the home network? You will need something to plug into the cameras to configure them. A laptop or netbook at least. You can’t get them to connect to any wireless access points otherwise. I am having trouble getting the email notification setup. It keeps saying error connecting to server every time I try a test. I have tried setting up both a hotmail and a gmail account using the server configurations I find when I search google but both setups do not work. My mini CD failed, can you tell me where I can download it please. I haven’t seen anywhere to download the software again, but I can upload an image of one if you’d like. Hi, I would love an image of the CD! Any idea if it will work on Windows10? I’m not sure whether it works on Windows 10 but I’ll upload the ISO as soon as I can. Does this work on Mac/Apple OS? The P2PIPC.apl software keeps crashing when a camera is attached. This has happened since i upgraded to android version 5. Is there a fix for this? I haven’t had any issues with the App. Have you tried uninstalling + reinstalling? My video feed is upside down. 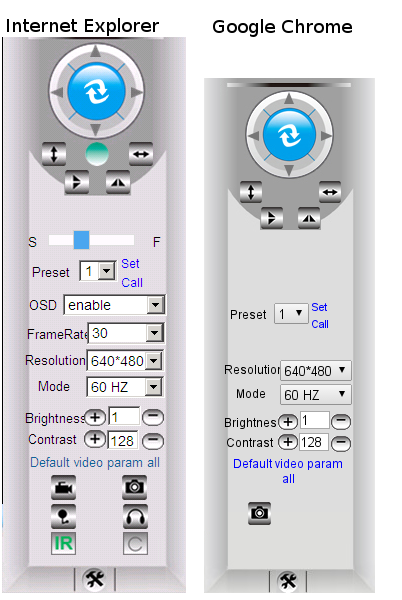 The buttons under the controls on the IPCam Web interface lets you mirror/flip the image. Hello, has anyone tried setting up the remote recording functionality for the IP900 camera? Do you mean remote recording through the App or recording to a remote location? Recording to a hard drive? It’s possible to record to a hard drive, depends on where this hard drive is. Is it in a network enclosure / NAS ? or is it a USB hard drive? no it won’t be to a NAS. Just a USB harddrive connected to the PC. Not sure if that’s possible at all. I didn’t realise it even had a siren? I’ll have a poke around and find out. my ip900 cam didn’t recognize my sd card (microsd) both 32gb and 128gb, but this card is ok in my phone and laptop, what can i do? perhaps the SD card is too large? Can you try with smaller SD Cards? like 8 or 16GB? https://drive.google.com/file/d/0B1RhPrxJp7gyb3Z1dENXQmhQWVk/view <== this is the zip file of the CD, let me know if it works. Can you please reupload the file? we cant download from google drive. it says it has a virus and the owner can only download the file. Ok, I’ll check out the files…They were copied straight from the CD though so I might have to run an AV scan on the CD itself. I have 2 IP900s bought from K-mart at $5 each on runout. I dont use them any more. I’m not sure a virus is the right description, BOTNET seems more appropriate…. Might be sensible to spend money on a trusted IP camera brand instaed. I’m actually still using these cameras, however I do have them firewalled off from the internet. For $30 at the time, they were reasonably priced, ignoring the fact that they’re wide open.